At our Swamp Romp recording sessions - (L-R) Kevin Clark, Roger Lewis, Craig Klein, Johnette Downing, Scott Billington, Kevin Harris and Tim Laughlin. New Orleans is a horn players’ town. 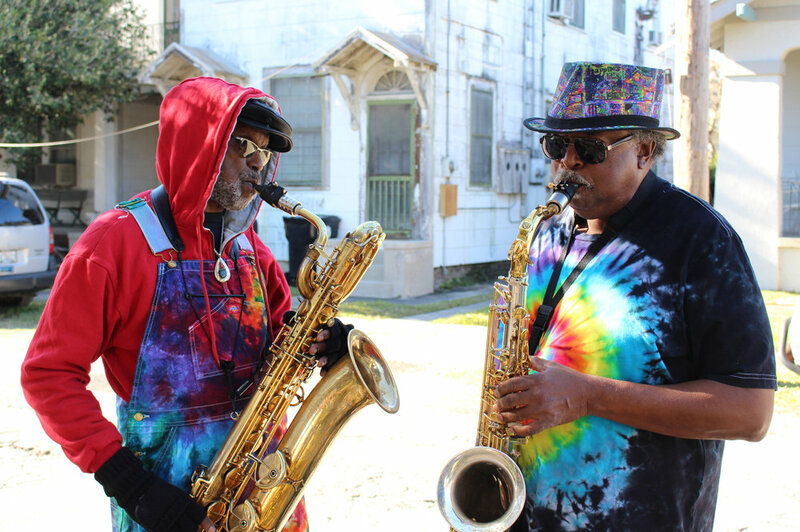 Other instruments, especially the piano, have figured prominently in the history of New Orleans music, but it is the horn players who have led the way, going back to the days of pre-jazz brass bands in the 1800s. The first great soloist and celebrity to record jazz music was Louis Armstrong, followed by Sidney Bechet, Pete Fountain, Al Hirt, Wynton Marsalis, Kermit Ruffins and Troy “Trombone Shorty” Andrews, to name a few, along with rhythm and blues players such as Lee Allen and Sam Butera. Johnette wrote the chorus of “Bamboula Rhythm” while walking down the street, singing the word “bamboula” in cadence with her steps. The “bam-bam-bam-boula” lyric that she improvised that day spells out the rhythm that is the foundation of much New Orleans music, from the second-line brass band style, to the beat played by the Mardi Gras Indians. The arrangement of our recording of “Bamboula Rhythm” celebrates the contemporary brass band sound, with three of the musicians who created the modern style in the 1970s. In the 1970s, the brass band sound was becoming staid, and, some would say, out of date, with few young people picking up horns and drums to replace the dwindling ranks of older musicians. The banjo player and author Danny Barker, along with the Reverend Andrew Darby, founded the Fairview Baptist Church Marching Band as a way to bring young people back into the music, and their project was so successful that alumni would come to include drummer Herlin Riley, trumpet player Leroy Jones, and many of the musicians who would go on to found the Dirty Dozen Brass Band. Sousaphonist Kirk Joseph, baritone saxophonist Roger Lewis and tenor saxophonist Kevin Harris, along with their bandmates in the Dirty Dozen, gave the brass band community exactly the jolt it needed as they began playing funk, bebop and pop songs in second-line parades and at clubs such as the Glass House, where young dancers flocked to listen and move to the new sound. Almost all the younger brass bands to come along since have followed the course set by the Dirty Dozen. Kirk brought the sousaphone to a level of virtuosity that no one had previously imagined, playing intricate funk bass lines and exploring the upper range of the instrument. Indeed, few musicians—banjo player Béla Fleck comes to mind—have so radically transformed their instrument. Today, no sousaphone player, whether in a Mexican banda, or in a Serbian wedding band, has not been directly or indirectly influenced by Kirk, the acknowledged world master on his instrument. On “Your Best Pair of Shoes,” Kevin and Roger are featured in a different role. Many of the classic New Orleans rhythm and blues records of the late 1950s and early 1960s—by Shirley and Lee, Huey Smith and the Clowns and many others— feature a chugging two-saxophone section, most often the studio musicians Alvin “Red” Tyler on baritone sax and Lee Allen on tenor (whose rhythmic, close-harmony saxophone playing set the stage for what Roger and Kevin would later play with the Dirty Dozen). We pay homage to this wonderful New Orleans sound with this song, which lets you know that you can do anything you can possibly dream about—as long as you wear the right shoes! Over the years, Scott has had the privilege of producing five Dirty Dozen albums, from 1987’s Voodoo (which featured Dizzy Gillespie, Dr. John and Branford Marsalis) to 2012’s Twenty Dozen. His friendship with Kirk, Roger and Kevin is celebrated with these new songs. There’s another kind of New Orleans horn music with roots in the same early brass band sound: traditional or Dixieland jazz (the term Dixieland derives from a mid-1800s ten dollar Louisiana bank note, emblazoned with “dix”—the French word for “ten”). This joyful sound is characterized by polyphonic, or collective, improvisation, with trumpet, clarinet and trombone weaving simultaneous melodies around each other. For “Who Got the Baby in the King Cake,” we enlisted three players from the Dukes of Dixieland—trumpet player Kevin Clark, trombonist Craig Klein and clarinet player Tim Laughlin. 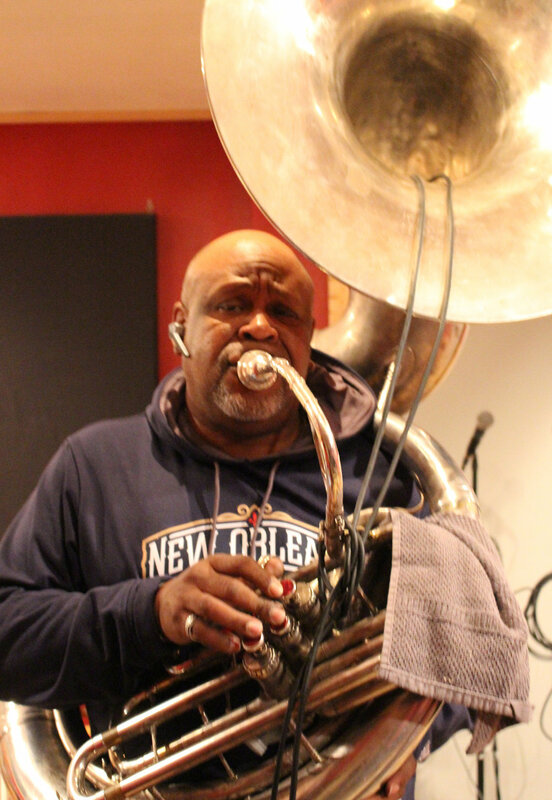 Scott had previously worked with Kevin and Craig on the recording Funknicity by the New Orleans Nightcrawlers, and Craig was a part of the horn section on Scott’s record with the wonderful singer Johnny Adams, Man of My Word. Dixieland jazz is a sound that Johnette heard as a girl, when her parents would take her to the French Quarter, where they would often stand outside the doors of the many clubs to listen to the music inside. Set to a classic New Orleans groove of “Who Got the Baby in the King Cake,” celebrates one of the great culinary joys and traditions of the Carnival season. You can hear the horns playing counter melodies that never seem to interfere with her vocal or with each other, buoyed by the rhythm section of bassist James Singleton, drummer Doug Belotte, and Johnette’s ukulele. As you can hear, there may not be a happier sound on the planet. Johnette also has a full album of jazz songs that she recorded in collaboration with trumpet player Jimmy LaRocca, Dixieland Jazz for Children. Jimmy is the son of trumpet player Nick LaRocca, whose band, the Original Dixieland Jazz Band, recorded the first jazz record in 1917. It’s a sound that never goes out of date. On the Swamp Romp album, we celebrate the many styles of Louisiana roots music, and we’ll look forward to sharing more background information on the songs with you in the coming weeks.